Georgios Leventis is member of the research group and PhD candidate at the Geospatial Analytics Research Lab of the Department of Civil Engineering and Geomatics at Cyprus University of Technology (CUT), directed by Prof. Phaedon Kyriakidis. His research interests include -among others- Spatial Analysis, Cultural Heritage, use of Data Mining techniques, training of Neural Networks for Machine and Deep Learning. Georgios conducted his bachelor studies at the Department of Cultural Technology and Communication at the University of Aegean, where he was being given with the necessary background towards the use of Informatics and New Technologies within the multidisciplinary field of Cultural Heritage (CH). 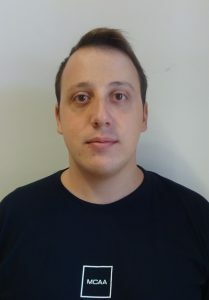 Alongside his studies, he was a member of the Intelligent Multimedia and Virtual Reality research laboratory of Prof. Georgios Tsekouras, where as a result of his research participation was the dissertation οn “Developing an Optimal Fuzzy Clustering Algorithm for the Training of Radial Basis Function Neural Networks” as well as its publication in the form of a research article at the proceedings of the IASTED conference. Georgios continued with his post-graduate studies (MSc) at the same department thus acquired the opportunity to deepen his knowledge on training and using the Artificial Neural Networks (ANN’s). In 2016 he became a member of the Digital Heritage Research Lab (directed by Dr. Marinos Ioannides) at the “Initial Training Network on Digital Cultural Heritage” (ITN-DCH) project, which was part of the available Marie Skłodowska-Curie fellowships for young researchers living in Europe. During this scholarship, Georgios was able to broaden his knowledge at the cultural field as well as to work on the use of Convolutional Deep Learning Neural Networks and how these can be of help in extracting meaningful patterns from Byzantine icons/frescoes and how the derived results can be reused in various aspects of CH. The outcomes of his research work as a Marie Skłodowska-Curie fellow were published in the form of a book chapter by Springer, as well as in several research papers submitted at conferences of the field. Alongside his doctoral studies, he works as a researcher in several European projects relevant to his background under the coordination of Prof. Phaedon Kyriakidis and Prof. Dimitrios Skarlatos, as well as he is also a teaching assistant at the Department of Civil Engineering and Geomatics, Cyprus University of Technology.